Applications include: purging gases from chambers, exhaust, evacuate or prime using liquid, steam or air as an operating media. 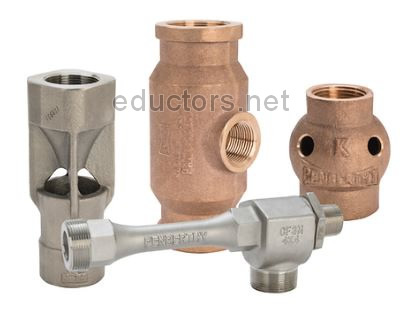 Stocked in Carbon Steel, Bronze and 316SS with sizes 1/2" through 3"
Applications include: circulating cleaning solutions, pasteurization, sterilization, heating water, degreasing, pickling, and more! Stocked in Carbon Steel, Bronze and 316SS with sizes 1/2" through 3"
Jet eductors and jet pumps for pumping, mixing and steam heating. NCI Jet pumps have a myriad of uses. Jet pumps not only pump liquids, they can also heat, mix and blend either in-line or in-tank. NCI Jet pumps can evacuate gases, create a vacuum, boost suction pressures, mix granular solids with liquids and move granular solids with compressed air. In fact, you will be surprised at what a jet pump can do to solve your problem. Simple design with no moving parts to wear out. Easy to install without special structures or foundations. Cast, fabricated or non-metallic constructions. Variety of materials to suit specific charactistics of the process liquids. Critical flow paths machined smoothly with no abrupt turns or steps, producing the most efficient flow during the motive function. We invite you to explore the possibilities of jet pump use in your operation. You might be surprised at the many ways jet pumps can help improve your company’s profitability! Suitable for a broad range of applications including: handling condensate, pumping wells, circulating solutions, emptying cesspools, pumping brine solutions, extracting solvents, draining cellars, pumping out barges, acidifying, causticizing oils, producing emulsions, elevation water. While jet eductors may differ in appearance, basic operation is the same. Jet pumps, also known as eductors, operate on the principles of fluid dynamics. An operating fluid media, which is referred to as the MOTIVE, placed under pressure enters the inlet and is forced through the nozzle where it is converted into a high-velocity stream. This high-velocity stream decreases the pressure in the suction chamber, creating a partial vacuum that draws the suction material into the chamber where it is entrained by the motive media. Once the SUCTION stream is drawn in, shear between motive media and the transported material causes both media to be intermixed and pumped out the DISCHARGE outlet, dispelled at a pressure greater than that of the SUCTION stream but lower than that of the MOTIVE. This basic principle of fluid dynamics is what makes jet pumps work.